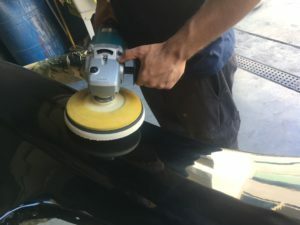 Sanding and Buffing | Creating the Perfect Paint Job | DH Automotive, Inc. Welcome to this next post in our “Creating the Perfect Paint Job” series. If you haven’t been following along and want to get caught up, head back to the first post in the series, “Nine Steps to the Perfect Paint Job“. This month, we tackle the final phase of the paint which is coloring, sanding and buffing. With a little patience and technique you can take a good paint job to a master piece. Before we dive in though, I want to make a note that we will cover runs and paint repairs (in next blog entry after next month’s final entry on the 9 part series). Ok, let’s begin! In the last post, we left off with the car/truck that has been freshly painted. You want to wait several days if not weeks to allow the clear coat to fully cure. My preference is the good old sun baked, now with special candies. Day-glow colors would not be a good idea, but for our set up we choose a solid color. First thing to do is to remove all the masking, within 24 hours after the paint has been applied. Some guys like to keep all the paper, tape, etc. on to keep the polish, and debris from going inside the vehicle; however the longer you leave the take on the harder it will be to remove it and we do not want to tear the paint! After the masking paper is off, we let the car sit out in the sun for 10 days. It’s been in the hundreds lately in Van Nuys, so I’ve taken full advantage of the weather; the first thing to do is prepare a bucket of clean water with dish soap this will allow the wet sanding to glide and not catch causing tears in the paint. Use sand paper starting off with 1000 grit, and working our way up to 2000 grit. Quick Tip: you will need to stay away from using sanding by hand only. This will create waves which will show up after buffing and we don’t want that. A block, a small section of a paint stick is what I recommend. 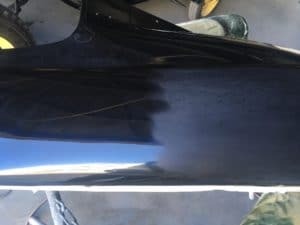 I like to use a section of radiator hose when hitting the couture spots of the fenders and rear quarter panels, or anything that has a flat surface which will help cut down on the orange peel (small ripples in the clear coat). Use the cross hatch method of sanding (north to south then coming back and hitting east to west direction). Once you start to create a milky substance, you know you’re knocking down the clear coat. 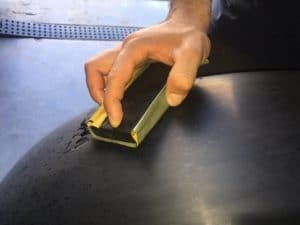 Between each sanding, you would want to stop and remove the sandpaper and allow the block to squeegee the water and debris off. Afterward, check the surface; what you’re looking for is a soft matted finish void off any orange peel or runs. Start in the back of the vehicle – the trunk lid is my go to place. Every so often I’ll stop sanding, and using my block to clear away most of the water, I’ll go back over with a dry cloth, allowing the surface to be dry. I then start to look at it from every angle to see how I’m coming along. Once I’m satisfied with that section, I move on until the entire car has been sanded. Key note: stay away from any ridges or tight spots where the buffer cannot reach. Now don’t freak out if say you sanded the car down and began buffing only to discover that there is a section that still has orange peel. Stop immediately and bring back the sandpaper and sand that section again. Don’t be afraid to go through the sandpaper, you want to allow the paper to do the work of cutting the clear coat. No need to push down too hard, doing that will cause waves, and in some cases you’ll burn through the clear coat! A heavy polish for taking out scratches. A medium polish that will remove fine scratches and imperfections. Glazings polish to give you a mirror like finish. Using a wool pad (you can use foam, although I prefer old school), apply the first phase of polish small amount; most polishes come in large bottles. I like to transfer each of the three polishes into small hand held bottles for easy application during polishing. I also apply the polish to the surface first then allow the wool pad to catch it moving in a left to right motion, all the while not stopping for fear of burning the paint. 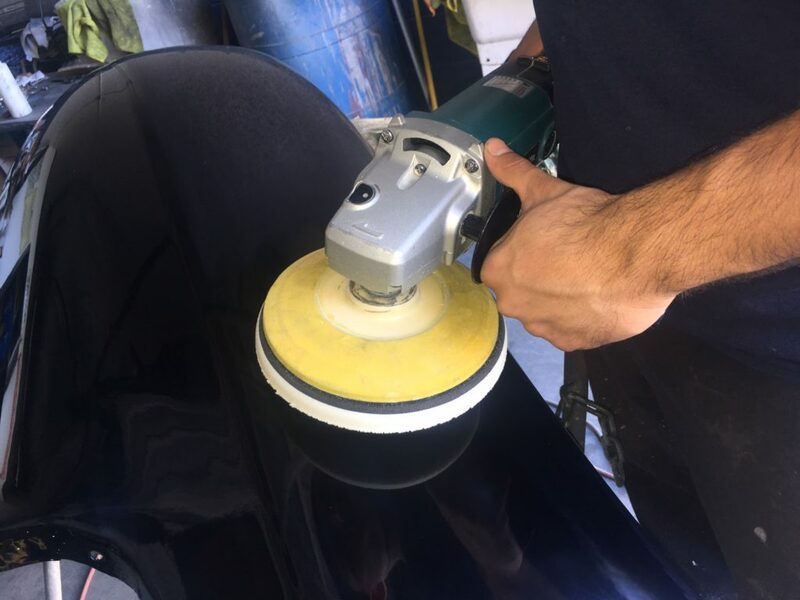 Use a generous amount of each polish and take a small section of the car at a time between each polishing stages. I wipe down the paint with a clean rag, each phase of polish will need its own pad. 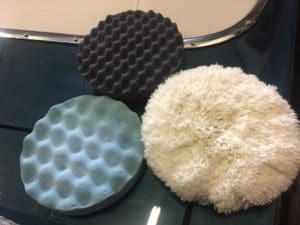 I like to use a double sided wool pad, then for the medium stage a black foam pad, and for the last part a light blue foam pad to finish up with the glaze. If you have removed the fenders, hood, and trunk for paint, you want to tackle each piece separately using a saw horse that will not allow the piece to slide around or chip the paint. Remember there are several ways to go about the sanding and buffing stage of creating the perfect paint job, and this is mine; however we can all agree that the end result should be a mirror finish we are looking for. Next month we finish out this series with the final phase of fit and finish, so until then, Happy Sanding!